Media: TV: ESPN-U 5 a.m. Pac-12 Network 5:30 p.m.
Football recruiting geeks live for this day as high school seniors across the nation sign on the dotted line, committing to their favorite school. Oregon’s class has shaped up to be very good; they’re ranked 14th nationally by Rivals.com. The burning question for Duck fanatics: Will Vernon Adams, Eastern Washington’s exceptional quarterback, flip to the Ducks? Check out FishDuck.com for the latest updates throughout the day. 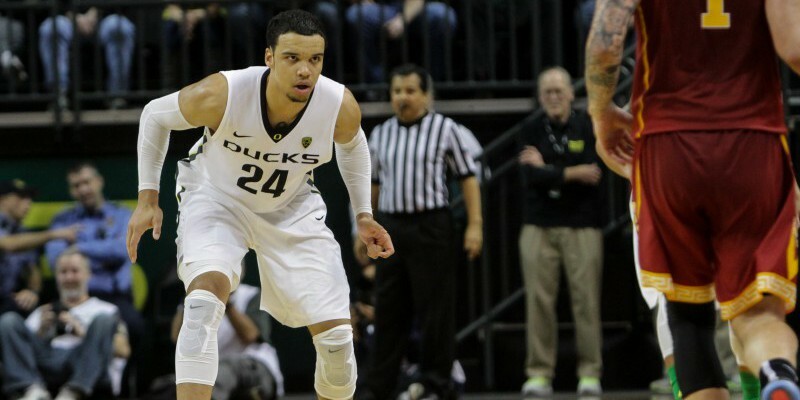 2/4/15 Men’s Basketball – Oregon vs Washington – Matt Knight Arena 4 p.m.
Lookie here: the Ducks are tied for fourth place in the Pac-12, along with the Beavs and the Bruins. They’ll have to up their game to stay in the hunt for a spot in the Big Dance. In the trip up north earlier this year, the Ducks were swept by the Washington schools, but with Michael Chandler and Roman Sorkin helping out at the post position, this isn’t the same team. 2/4/15 Acrobatics and Tumbling – Oregon vs Azusa Pacific – Azusa, CA 6:30 p.m. The Ducks open their season in sunny California. Men’s golf travels to Hawaii. What could be better? It just doesn’t seem fair. The men’s golf team gets three days in the sun in Hawaii, the women get to play the Beavs in rainy Portland. 2/6/15 Women’s Basketball – Oregon at Washington State 5 p.m.
Kelly Graves‘s squad is coming off a sweep of the Los Angeles schools and is improving every week. Jillian Alleyene earned Pac-12 Player of the Week honors with her performance against UCLA. She scored the game-winning basket and totaled 30 points and 25 rebounds, insane numbers in any league. 2/6/15 Men’s Tennis – Oregon vs Indiana – Bloomington, IN 11 a.m. The tennis team is coming off a strong showing against Nevada last week when they blanked their opponents 5-0. Oregon vs Cal Poly 10:30 a.m.
Oregon vs. Texas 5:30 p.m.
Oregon vs Northwestern 2:45 p.m.
Oregon vs North Carolina 5 p.m.
Oregon vs Wisconsin 10 a.m. The Oregon softball team starts its season with a bevy of games down in the desert. The second-ranked Ducks finished in the College World Series Final Four in 2014 and are aiming at an NCAA Championship. 2/8/15 Women’s Basketball – Oregon at Washington 5 p.m.
2/8/15 Men’s Basketball – Oregon vs WSU – Matt Knight Arena, Eugene 4 p.m. There are a couple of reasons to catch this Sunday matchup. First, Ernie Kent makes his return to Matt Knight and second, if you’re a Duck football season ticket holder, you can take a gander at the Pac-12 and Rose Bowl trophies. Regular folks will get their opportunity later this month. 2/8/15 Men’s Tennis – Oregon vs Louisville – Louisville, KY 7 a.m.